There is currently much excitement in the world of Internet archaeology following the discovery of a large number of almost intact websites dating from the mid-90s. Researchers have only just begun to record and catalogue the haul, which is thought to consist of over 5000 files. "Most of these are text-heavy pages with just a scattering of low-resolution images," said chief conservationist Dr Sheila Backlink. "Although, we have come across quite a few all-singing, all-dancing intro pages with flashing images, scrolling text and annoying music that it's impossible to shut off. We isolate these as quickly as possible on encrypted hard drives and send them to a special laboratory in Helsinki where they can be studied under secure conditions." No details have yet emerged about the content of these pages although, judging by their vintage, it is expected that roughly 80% will turn out to be Star Trek: The Next Generation fan sites. 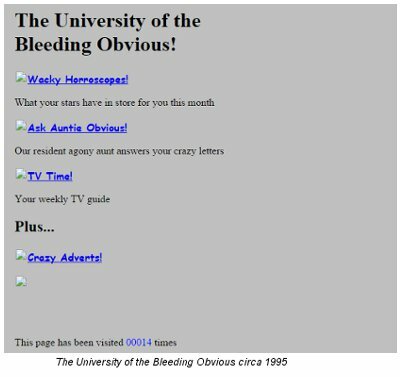 Nevertheless, this find does open up a window into the early days of the internet and, since most websites from this period have either disappeared or been built over, it offers a unique opportunity for web historians. However, they will need to work fast in order to preserve this extraordinary legacy. "Websites decay very quickly once exposed to the atmosphere," Dr Backlink told us. "These have been buried quite deep beneath a rarely visited top level domain, but now that we have uncovered them we will have to work quickly to prevent link rot, text phasing and tag deprecation. It's a difficult task because technology has moved on and it's tricky to find a modern browser that will still work with archaic, out-of-date, non-compliant code. Fortunately we have Internet Explorer, so we're not too badly off." How Mad Are Mad Hatters?